You can search and create graphs for all recordings in the same study. Manager automatically puts imported recordings into the same study if their study configurations match. If they do not match, you can merge the recordings into a single study. You may want to keep multiple related studies in the same project to help analyzing over the lifetime of a project. For example, you may start your project with a focus group, followed by paper prototype testing, electronic prototype testing, and final product testing. With these four studies in the same Morae project, you can create highlight clips with videos and graphs from all of the studies. With a project open in Manager, choose File > Import > Recordings. 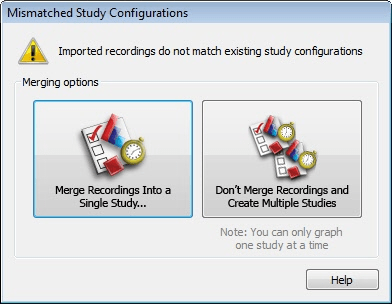 If the study configurations of the recordings do not match each other or if the imported recordings don't match an existing study, the Mismatched Study Configurations dialog box appears. 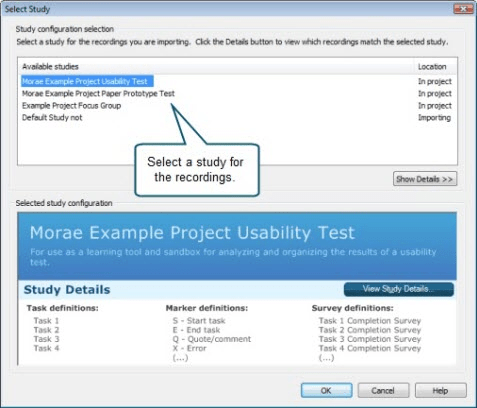 Click the Merge Recordings Into a Single Study button. The Select Study dialog box appears. If you click the Don't Merge Recordings and Create Multiple Studies button, the recordings are imported into multiple studies. Select a study for the recordings. Click Show/Hide Details to view which recordings match the study. Click View Study Details to open a copy of the study details for the selected study. When finished, click OK. The Merge Recordings into Study dialog box appears. When you finish matching items, click OK to merge the recordings into the study. Select a task definition on the left from the recording. 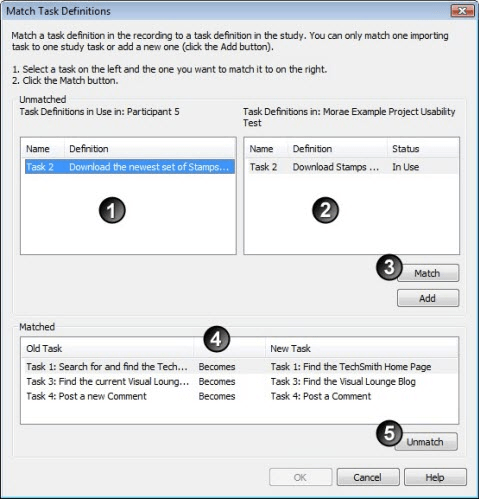 Select a task definition on the right from the study. If you match a task, Matched appears. If you are changing a definition, Becomes appears. If you are defining an undefined task, Defines appears. If you are adding a new task Added as New appears. To change any of the matched task definitions, click Unmatch and the task definitions reappear in the Unmatched group box. Click Add to add a new task definition to the study. Select a task score on the left from the recording. 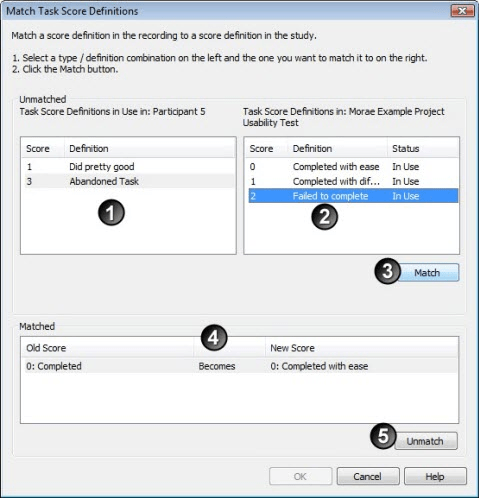 Select a task score on the right from the study. If you match a task score, Matched appears. If you are changing a task score, Becomes appears. If you are defining an undefined task score, Defines appears. To change any of the matched task scores, click Unmatch and the task score definitions reappear in the Unmatched group box. Select a marker definition on the left from the recording. 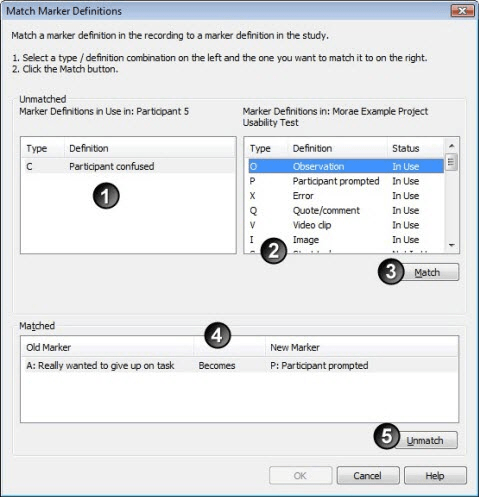 Select a marker definition on the right from the study. If you match a marker, Matched appears. If you are defining an undefined marker, Defines appears. To change any of the matched marker definitions, click Unmatch and definitions reappear in the Unmatched group box. Select a marker score on the left from the recording. Select a marker score on the right from the study. If you match a score, Matched appears. If you are changing a score definition, Becomes appears. If you are defining an undefined score, Defines appears. To change any of the matched marker scores, click Unmatch and the marker score definitions reappear in the Unmatched group box. 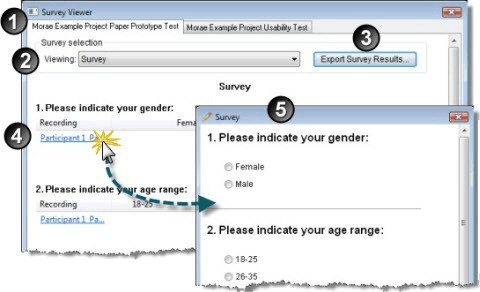 If you merge recordings with different surveys, you need to look at and update the surveys. 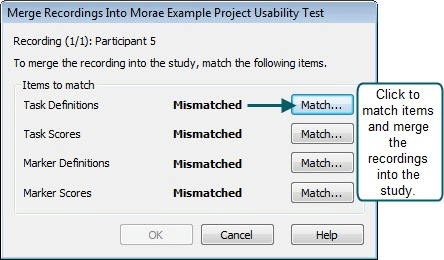 During study merging, all surveys that do not match are added to the study, and answers from matching surveys are merged into the existing surveys. Export survey results into a comma separated values (CSV) file to open in other programs, such as Microsoft Office Excel. Graph survey answer frequency and average scores. Click a recording name to open the survey for editing. Edit or enter survey answers for the selected recording.